The greatest artist of Flanders – Franz Snyders is the largest master of pictorial still life, his hands belong to dozens of works recognized as masterpieces of pictorial art. Snyders wrote his life-rich still lifes under the slogan of greatness and all-embracing power. It is known that Rubens and Snyders mutually influenced each other in the formation of artistic talent, they collaborated a lot and were close friends. It is also known that the artists shared sketches with each other and embodied them in their independent works. 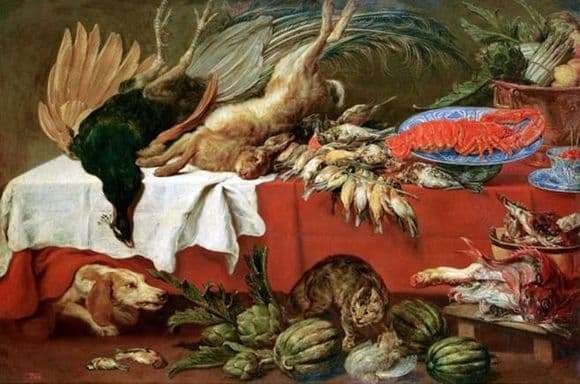 “Still life with bat game and lobster” is a picture written by him during the culmination of his creative genius, under the influence of constant improvement of the writing technique, so the viewer can enjoy all the grandeur of artistic mastery. Snyders is an artist who revived still lifes, made an image of “dead nature” (the literal meaning of the French word “still life”), giving his paintings a unique dynamics of shape and color. One has only to pay attention to what a stir the hunting dog, who has just returned from the morning “round-up” and the cat who cannot admire the huge lobster, created with their pranks. ” Everything collected and caught in the hunt just does not fit on the table! So many dishes depicted by the artist simply cannot make the viewer believe that the image is static! In addition, Franz Snyders uses contrast techniques to heighten the sensation of dynamics: against a snow-white tablecloth, everything around looks even more expressive: from collected cereals, but a wounded rabbit. The artist skillfully uses his abilities to paint the interior – the red, white fabrics perfectly harmonize with each other, attracting attention to all those immense dishes that are laid out on the table. To date, an excellent picture of Franz Snyders is stored in the State Hermitage Museum, in St. Petersburg.